Background: Clerodendrum infortunatum is a medicinal plant found especially in the Sub-Himalayan regions of West Bengal. Various tribal communities of this region have been using these plants as a source of natural medicine. Objective: Medicinal values of C. infortunatum are well established, but the immunomodulatory properties have never been studied. Therefore, we wanted to investigate various immunomodulatory activities of this plant. Materials and Methods: Several parameters such as plaque-forming cell assay, hemagglutination titer, phagocytic activity of macrophages, and inhibition of lipopolysaccharide (LPS) were performed. Moreover, effects of C. infortunatum on the weight of various organs and total serum protein, albumin, and globulin levels were also determined. 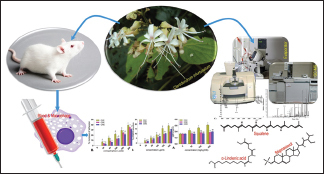 The phytochemical fingerprints of C. infortunatum extracts were obtained from Fourier transform infrared and gas chromatography-mass spectrometry analysis. Results: The macrophage stimulation and plaque-forming cell numbers (using sheep red blood cell as antigen) were significantly proliferated and found optimum at 100 and 250 mg/kg doses of leaf and root extracts simultaneously. The extent of stimulation in mural humoral immunity was in the order of leaf > root > stem. The anti-inflammatory activity of C. infortunatum was confirmed by the inhibition of LPS-induced nitric oxide synthesis by macrophages. Conclusion: It can be concluded that 70% hydromethanolic extract of C. infortunatum has profound immunomodulation potentials in the murine model, stimulating both humoral and innate form of the immune system. Abbreviations used: PFC: Plaque-forming cell assay; HA titer: Hemagglutination titer; LPS: Lipopolysaccharide; FTIR: Fourier transform infrared; GC-MS: Gas chromatography-mass spectrometry; SDS: Sodium dodecyl sulfate; sRBC: Sheep red blood cell; PBS: Phosphate buffer saline; PC: Phagocytic capacity; PI: Phagocytic index; NaCl: Sodium chloride; CaCl2: Calcium chloride; NBT: Nitro blue tetrazolium; DMSO: Dimethyl sulfoxide; KOH: Potassium hydroxide; H2SO4: Sulfuric acid; HOCl: Hypochlorous acid; H2O2: Hydrogen peroxide; EDTA: Ethylenediaminetetraacetic acid. It can be concluded that 70% hydromethanolic extract of C. infortunatum has profound immunomodulation potentials in the murine model, stimulating both humoral and innate form of the immune system. Currently, there is a worldwide increase in diseases, especially the infectious disease. This requires a proportionate increase in body's defense mechanisms to control the wrath through a process called immunomodulation. In developing nations, malnutrition and infectious diseases have always worked hand in hand. This remains a challenge as they compromise the body's immune responses, especially in the affected individuals. Effective immune responses typically involve antigen presentation, activation of T- and B-lymphocytes, and secretion of immune effectors molecules such as antibodies and cytokines. Various tribal communities confined in different parts of India use medicinal plants for the treatment of several diseases. Even in ancient civilizations of Mesopotamia, Egypt, Greece, India, and China, the plant-derived medicines were extensively consumed for the treatment of various inflammation and tumor., Many immunomodulatory agents derived from plant products are used to either suppress or stimulate the immune responses of an organism against the antigens. In the rural areas of the Sub-Himalayan region, there are lots of tribal populations such as Munda, Oraon, Santhal, Rava, Gurkha, and Lepcha, who are suffering from malnutrition and various infectious diseases. These tribal populations do not fulfill their required amount of dietary supplement to have a proper defensive immune system. The allopathic medicines are obviously the first choice when it comes to counter any sort of infection. These allopathic drugs stimulate or suppress the immune functions rapidly but have many side effects. Moreover, these drugs are very expensive for the poor people. In distant places and rural areas, these drugs are not easily available, and in the most cases, they are associated with advance drug reactions. As a result, the majority of tribal populations turn to use alternative herbal medicine that is widely accepted, is easily available, and assumed to have fewer side effects. In the present investigation, C. infortunatum Linn. is selected to ascertain its ethnopharmacological importance with scientific evidence. C. infortunatum Linn. is a shrub found abundantly in the Sub-Himalayan regions of West Bengal and Sikkim provinces of India. This plant is used as traditional medicine to cure common ailments such as bronchitis, asthma, fever, blood infection, inflammation, burning sensation, tuberculosis, and hepatoprotective. It is also used as an antiepileptic in Indian folk medicine., Conventionally, the Kuki and Rongmai Naga tribes found in Northeast India use this plant extract orally to cure fever, bowel troubles, and scorpion sting. In Sub-Himalayan region of North Bengal, various tribal communities use fresh root bark as a remedy for diarrhea. Likewise, Kachari, Hmar, and Riang tribal communities of Barak Valley and North Cachar Hills use this plant to combat stomach pain and diabetes. This plant is also used as a bandage in swelling and vermifugation and in the treatment of malaria. There are some bioactive compounds that were isolated from C. infortunatum such as β-sitosterol, clerosterol, clerodolone, clerodone, and luperol, which have tremendous medicinal properties., Since no extensive immunomodulatory study in animal model has been carried out yet with C. infortunatum crude extract, we have attempted to evaluate the stimulation of murine immune responses by C. infortunatum. Besides these, we have also done the phytochemical fingerprinting of C. infortunatum using gas chromatography-mass spectrometry (GC-MS) and Fourier transform infrared (FTIR) analysis to identify the bioactive compounds which stimulate or enhance the murine immune system. C. infortunatum was collected between April and May 2016 from the medicinal plant garden of Department of Botany, University of North Bengal. The plant was identified by a plant taxonomist of Department of Botany, University of North Bengal. The specimen (Accession no. 9617) was deposited at the Herbarium of the same department. All solvents and materials were obtained from HiMedia Laboratories Pvt. Ltd (Mumbai, India), unless otherwise indicated. Lipopolysaccharide (LPS), Freund's incomplete adjuvant, and nystatin were procured from Sigma Aldrich, MO, USA. Sodium dodecyl sulfate (SDS) was procured from Merck Specialties Pvt. Ltd, Mumbai, India, and phosphoric acid was obtained from Thomas Baker Chemicals Pvt. Ltd, Mumbai, India. where W2: Weight of lyophilized extract and container, W1: Weight of container, and W0: Weight of the initial dried plant sample. Both male and female Swiss albino mice of 6–8 weeks of age and 25 ± 2 g body weight (BW) were used for all the experiments. Mice were kept in polypropylene cages, with paddy husk as bedding material. The experimental mice were maintained in the animal house of the Department of Zoology, University of North Bengal, with sufficient food and water ad libitum under a constant 12-h dark/light cycle at an environmental temperature of 25°C. Complement was collected from guinea pigs (250 g) to perform plaque-forming cell (PFC) assay. Immunization was done using sheep red blood cell (sRBC) which was preserved at the Departmental Animal House. Animal Ethical Committee (Registration No. 840/ac/04/CPCSEA) was approved for performing all the in vivo experiments. Both in vivo and in vitro experiments were performed to investigate the immunomodulatory activities of C. infortunatum. Acute toxicity study of C. infortunatum was done according to the Organization for Economic Cooperation and Development guidelines (test 423: acute oral toxicity–acute toxic class method; 2002). Mice were divided into six groups (n = 6) for leaf, stem, and root extracts and were made to fast overnight before the experiment. Hydromethanolic extract of C. infortunatum was administered orally at 1000 and 1500 mg/kg of BW dose and carefully observed for the development of any clinical or toxicological symptoms up to 48 h.
Sixty Swiss albino mice were divided into ten groups (n = 6 per group) for in vivo immunomodulatory study. All the extracts were received orally for 20 days to perform the in vivo experiments. Group I (normal) received normal saline. Groups II, III, and IV (experimental) received C. infortunatum leaf extract (CILE) 50, 100, and 250 mg/kg BW, respectively. Groups V, VI, and VII (experimental) received C. infortunatum stem extract (CISE) 50, 100, and 250 mg/kg BW, respectively, and Groups VIII, IX, and X (experimental) received C. infortunatum root extract (CIRE) 50, 100, and 250 mg/kg BW, respectively. To measure the body and organ weight and count the splenocyte and leukocyte at day 21, 24 h after the last dose, all the animals were sacrificed under a proper anesthetic condition, and relative organ weight (organ weight/100 g of BW) of the liver and spleen and the percentage BW gain/loss were measured. Single cell suspensions of the spleen (prepared in RPMI containing 5% fetal bovine serum [FBS]) and total leukocyte were prepared (using Leishman stain) to count the cellularity by hemocytometer. The PFC assay, the key experiment to determine the effect of immunomodulation, was performed according to the standard method with slight modifications. Mice were immunized with sRBC at day 17, and on the 4th day, all the mice were sacrificed under proper anesthesia. A single cell suspension of the spleen was prepared in phosphate buffer saline (PBS) and cells were adjusted to a concentration of 106 cells/ml. 0.1 ml cell suspension was mixed with 0.05 ml guinea pig complement and 0.05 ml of 25% sRBC. Glass slide and bi-gummed tape (Scotch Brand, St. Paul, MN) were used to prepare the Cunningham chambers., Then, the prepared samples were placed in the chambers and sealed with paraffin and petroleum jelly (1:1). After incubation for 4 h at 37°C, the plaques were counted under a phase-contrast microscope. The blood sample was collected from the immunized mice. The collected blood sample was kept at room temperature for 30 min for the separation of serum. After separation, straw-colored serum was isolated using centrifugation at 1000 rpm for 5 min. The isolated serum was diluted 10,000-fold for the estimation of immunoglobulin M (IgM) level using commercially available kit (MyBiosource, USA) according to the manufacturer's instruction. Hemagglutination (HA) titer assay was performed according to the standard method with slight alterations. Serum was collected from the blood on the 4th day of immunization with sRBC. After that, serum was kept in a water bath at 56°C for 45 min for the inactivation of complement activity. Khan tubes were used for the determination of HA titer. Serum (0.1 ml) and PBS (0.9 ml) were added to the first Khan tube. In the remaining Khan tubes, 0.5 ml of PBS was added. Then, 0.5 ml of mixture was added to the second Khan tube from the first one and 0.5 ml of the mixture was simultaneously added to the third tube from the second one. In the same manner, eight such dilutions were prepared as double-fold dilution; 0.5 ml of the solution was thrown away from the last tube, thus yielding a serial dilution of 1/10, 1/20, 1/40, 1/80, 1/160, 1/320, 1/640, and 1/1280. 0.1 ml of 10% sRBC was added to each tube. Then, all the Khan tubes were incubated at 37°C for 12 h in a humidified atmosphere, and after incubation, visible HA was observed and the degree of agglutination was also noted. The peritoneal macrophages were enumerated according to the standard protocol. 0.5 ml of Freund's incomplete adjuvant was injected in the peritoneum, 1 day before the experiment at day 20, to count the peritoneal macrophages. The peritoneal exudates were collected by washing the peritoneum with PBS. The peritoneal exudate cells were collected after a spin for 5 min at 1000 rpm in a centrifuge followed by washing two times in PBS; the remaining pellet was resuspended in PBS. The total mixture was incubated for 45 min at 37°C in a Petri dish. After incubation, the Petri dish was washed with 2% ethylenediaminetetraacetic acid in chilled PBS and centrifuged for 5 min at 1000 rpm. After centrifugation, the pellet was mixed in PBS. Neutral red, a vital dye, was added to the cell suspension, and the macrophages were counted using hemocytometer under the phase-contrast microscope. where A = percentage of yeast-ingesting phagocytes and B = number of yeast-ingested per phagocytes; PC = mean percentage of cells that engulfed ≥4 yeast cells. Serum was collected on the 21st day from the tail vein of a mouse for the estimation of protein, albumin, and globulin. Commercially available kits (Crest Biosystems, India) were used to determine the total serum protein, albumin, and globulin. where H0 is the absorbance of the blank and H1 is the absorbance of sample and standard (Triton X). where A0 = absorbance of the control (cells without treated plant extract) and A1 = absorbance of the test sample. The assay was performed according to the standard protocol with some modifications. Murine peritoneal macrophages were collected in RPMI-1640 as previously described and seeded into 96-well plate. The plate was precoated with 0.2% poly-L-lysine along with various concentrations (0–200 μg/ml) of C. infortunatum extracts. Zymosan (0.1%) was added and the plate was incubated for 30 min at 37°C under humidified condition. After incubation, cells were washed thrice with RPMI-1640 followed by staining with 100 μl NBT (0.3%) at room temperature (RT). The NBT solution was discarded after 30 min, and the reaction was stopped by addition of 100 μl absolute methanol. The formazan which was generated was dissolved in 120 μl of 2M KOH and 140 μl of dimethyl sulfoxide and the absorbance was immediately taken at 630 nm. The assay was performed according to the standard protocol with slight modifications. Murine peritoneal macrophages (2 × 106 cells/ml) were seeded into 96-well culture plate. To this, 100 ng/ml LPS and varying concentrations (0–200 μg/ml) of the plant extracts were added. The cells were then incubated at 37°C under a humidified condition for 60 min, and after incubation, the solutions from each well were centrifuged at 13,000 rpm for 10 min. After centrifugation, the supernatants were removed and 0.01% SDS (dissolved in RPMI-1640) was added to lyse the cells. The solution was centrifuged at 13,000 rpm for 10 min and the supernatant (100 μl) collected from each group was mixed with 100 μl substrate buffer (ortho-phenylenediamine). After 20 min, the reaction was stopped using 100 μl of 2N H2 SO4 and the absorbance was read at 492 nm. The characteristic of functional groups in leaf, stem, and root of C. infortunatum was identified by using FTIR spectrophotometer. 10 mg of plant extracts of leaf or stem or root was taken in CaF2 vessel and placed in a sample cup of a diffuse reflectance accessory. Shimadzu 8300 FTIR spectrophotometer was used to identify the functional group available in the extracts. The leaf, stem, and root extracts of C. infortunatum were scanned from 400 to 4000 cm−1 for 16 times to increase the signal-to-noise ratio. C. infortunatum extract was mixed with 5 ml n-hexane. Then, the mixture was incubated for 2 days at 4°C with occasional shaking and centrifuged at 15,000 rpm for 20 min at 25°C. The resultant supernatants were collected and filtrated using Whatman filter paper no. 1. Then, the supernatant (200 μl) was mixed with 20 μl of N, O-bis (trimethylsilyl) trifluoroacetamide + trimethylchlorosilane (99:1 v/v) mixture and incubated 60 min at laboratory temperature with occasional shaking. Thereafter, C. infortunatum extract was analyzed using Thermo Scientific Trace 1300 gas chromatography instrument attached with Thermo Scientific ISQ QD single quadrupole mass spectrophotometer. The GC was equipped with TG-5MS column (30 m × 0.25 mm × 0.25 μm). The inlet temperature was maintained at 250°C and the initial temperature of the program was set at 60°C (solvent delay 5 min) with a hold of 4 min, followed by a ramp of 5°C to 290°C with a hold of 10 min (60-min program). Samples of leaf, stem, and root extract of C. infortunatum (1 μl) were injected in a splitless mode (split flow 50 ml/min) with a splitless time of 0.80 min, using a Thermo Scientific AI-1310 auto-sampler with a constant flow of helium gas (1 ml/min). MS transfer line temperature was set at 290°C with an ion source temperature of 230°C (electron ionization). The individual samples were analyzed at electron energy 70 eV (vacuum pressure: 2.21e-0.5 Torr) and the mass analyzer range was set to 50–650 amu for better performance. All the plant extracts (leaf, stem, and root) were analyzed thrice for confirmation of the result. All data have been reported as mean ± standard deviation of six measurements. KyPlot version 2.0 beta 15 (32 bit) and Graph Pad Prism version 7.03 were used for statistical analysis. One-way analysis of variance with Dunnett's test was used to analyze the data. In the acute toxicity study, no sign of mortality of mice was observed following the concentration from 0 to 1500 mg of leaf, stem, and root extract of C. infortunatum/kg BW. Hence, 50 mg/kg BW, 100 mg/kg BW, and 250 mg/kg BW were selected for the in vivo immunomodulatory experiments. Effect of various doses of C. infortunatum extracts in different organs on the basis of weight is shown in [Table 1]. No significant changes in terms of increase or decrease in the BW, liver weight, and spleen weight were observed in mice that were fed with leaf, stem, and root extract for 20 days when compared with their respective control groups. The potentiality of C. infortunatum extract to modulate the humoral immune response is presented in [Figure 1]d. The most poignant increase in PFC value was found at 250 mg/kg BW dose compared to the control in case of all the extracts. Results of the HA titer [Table 2] showed the highest visible agglutination at the 100 mg/kg dose, followed by 250 and 50 mg/kg dose in case of CILE, and 250 mg/kg followed by 100 and 50 mg/kg BW in case of CISE and CIRE when compared to the control. In vivo IgM level is displayed in [Table 2] and [Figure 2]a. The IgM level at 0 mg/kg (control) was 0.33 ± 0.02 mg/ml. At 250 mg/kg, the level of IgM for CILE, CISE, and CIRE was 0.62 ± 0.02, 0.38 ± 0.01, and 0.40 ± 0.02 mg/ml, respectively. The dose-dependent correlation between PFC value and IgM level demonstrated high correlation between two interrelated parameters. 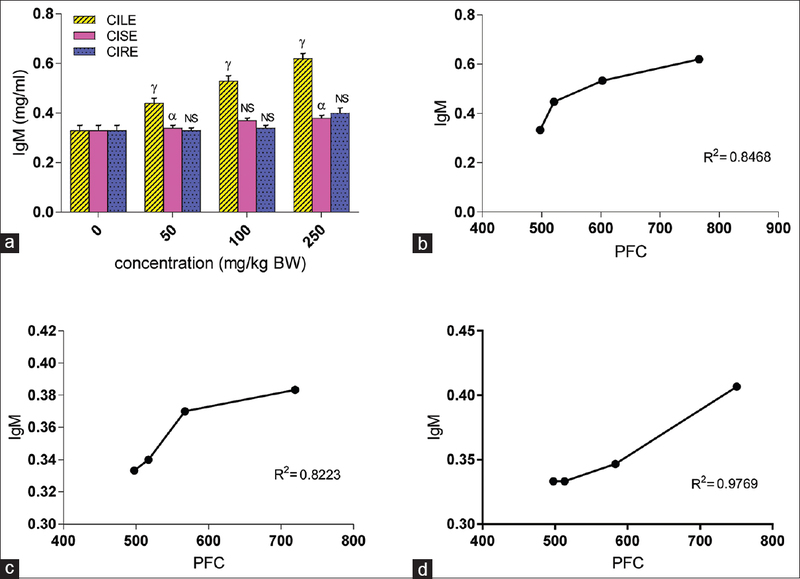 The coefficient of determination (R2) of PFC and IgM correlation for CILE, CISE, and CIRE was 0.8468, 0.8223, and 0.9769, respectively [Figure 2]b,[Figure 2]c,[Figure 2]d.
Peritoneal macrophages elevated with the increase in the dose of leaf, stem, and root extract of C. infortunatum, supporting stimulation of murine immune response [Table 3]. The most significant increase of the macrophage population was found at the dose of 50, 100, and 250 mg/kg BW in case of CILE and 250 mg/kg BW in case of CISE and CIRE, respectively, when compared with control groups. The effect of CILE, CISE, and CIRE on the PC of murine peritoneal macrophage is illustrated in [Figure 3]a and [Figure 3]b. The PC was measured by the mean percentage of macrophages engulfing >4 yeast cells. Among the three extracts, only CILE demonstrated significant increase (P < 0.01) in PC at 250 mg/kg dose as compared to 0 mg/kg dose (control group). In case of CILE, the PC at 0 mg/kg (control) was 12.66% ± 1.53% which was increased to 30.66% ± 2.52% at 250 mg/kg. In case of CIRE, the PC was 17.00% ± 2.00% at the highest dose. In case of CISE, the PC was 17.66% ± 2.09% at the highest dose. [Figure 3]b demonstrates the PI of CILE, CISE, and CIRE. The PI was calculated by multiplying the percentage of yeast-ingesting macrophages with the number of yeast-ingested per macrophages. Compared to 0 mg/kg (control group), the PI of CILE and CIRE was significant (P < 0.05) at 250 mg/kg dose. At the highest dose, the PI of C. infortunatum leaf extract (CILE) and C. infortunatum root extract (CIRE) was 162.66 ± 6.80 and 103.67 ± 11.06, respectively. Total serum protein, albumin, and globulin levels poignantly increased with the increment in the doses of various extracts of C. infortunatum [Table 3]. The protein level was significantly increased at 100 mg/kg and 250 mg/kg BW in case of CILE and CIRE extracts and 250 mg/kg BW in case of CISE. The protein level is significantly elevated at 250 mg/kg BW in case of CISE. The hemolytic activity of C. infortunatum on murine erythrocytes was negligible when compared to the standard Triton X, as presented in [Figure 1]a. The percent of hemolysis increased in a dose-dependent manner in case of all the three plant part extracts. Adherence property of macrophages increased in a dose-dependent manner with the increase in C. infortunatum extract concentration [Figure 1]b. Impressive result was observed with every dose of all extracts. An increase in absorbance signifies increased respiratory burst activity [Figure 3]c. Significance increases in absorbance were observed at highest dose (200 μg/ml) in case of CILE, CISE, and CIRE when compared with control group (0 μg/ml). Significant (P < 0.001) myeloperoxidase (MPO)-reducing capacity [Figure 3]d was observed in case of CILE, CISE, and CIRE. At 200 μg/ml, the amount of reduction of MPO for CILE, CISE, and CIRE was 18.59% ± 0.66%, 12.07% ± 0.75%, and 14.76% ± 0.71%, respectively. The inhibition of NO production from LPS-stimulated macrophage by C. infortunatum extracts is represented in [Figure 1]c. The inhibition of NO is increased in a dose-dependent manner for all extracts. The plant extract showed a significant NO suppression capacity for each dose. At the highest concentration of 250 mg/kg BW, the percentage of inhibition was 59.25% ± 3.26% and 50.33% ± 2.27% by leaf and root, respectively, which is very convincing. 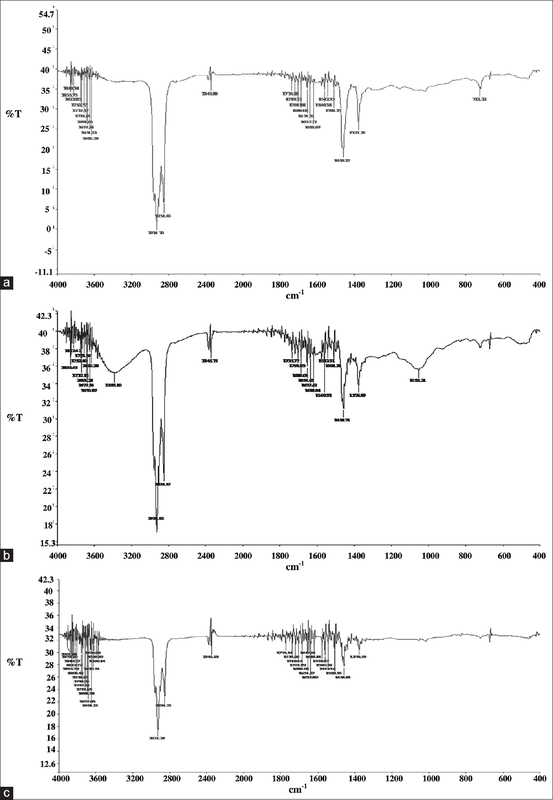 The IR spectrum [Figure 4] and [Table 4] of the leaf, stem, and root extract displayed different peaks corresponding to different functional groups present in C. infortunatum. Automated Mass Spectral Deconvolution and Identification System version 2.70 was used for MS data analyses. Mass fragmentation patterns using the database of National Institute Standard and Technology with an MS-Library Version 2011 were used for the identification of major and essential compounds. The identified several bioactive compounds from the leaf, stem, and root of C. infortunatum have diverse chemical nature; many of them possess distinct and definitive pharmacological activities [Table 5] and [Figure 5]. Most of the multicellular living organisms possess immune system. The immune system works either through the humoral pathway or by the cell-mediated pathway to destroy the foreign materials and causative agents of many diseases. The 70% hydromethanolic extracts of C. infortunatum have been investigated to possess immense immunomodulatory activities. Hydromethanolic extracts of C. infortunatum were chosen as the sample material, because in ethnopharmacology and traditional system, medicines are prepared mostly in polar solvents and many ethnopharmacological medicines are actually tinctures prepared by hydroalcoholic solvent extraction processes. 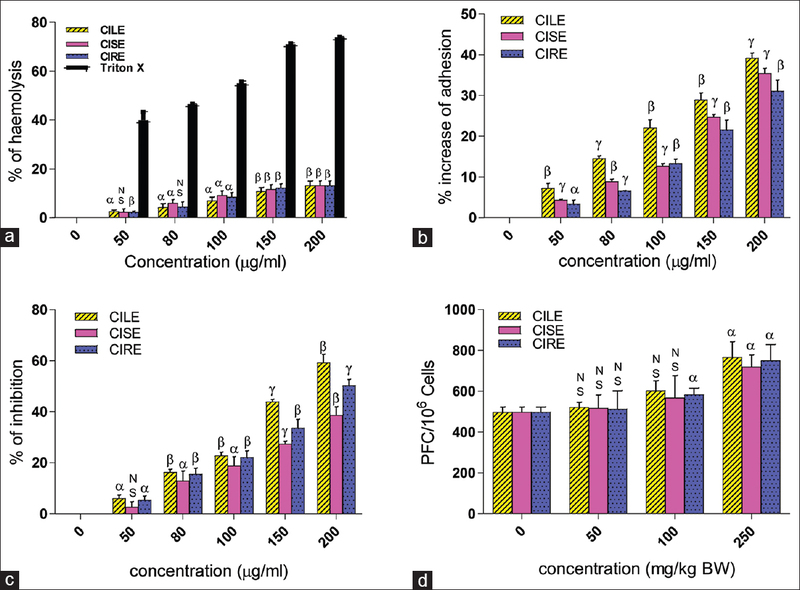 Immunomodulatory evaluation of CILE, CISE, and CIRE was performed using both in vivo and in vitro methods. Although the immunomodulatory potentialities of C. infortunatum have been claimed in the traditional medicinal systems, very few studies were performed to evaluate such claim. The BW and organ weight changes are one of the most crucial and sensitive indicators of an animal's health status, and it is widely accepted in the evaluation of test article-associated toxicities. In the present study, no significant loss of BW and organ weight was observed supporting nontoxicity of C. infortunatum. Initial evaluation of the stimulation of murine humoral immune system was performed by PFC assay and corresponding IgM level estimation. The PFC assay is based on complement-mediated lysis of foreign antigen (sRBC) through immunoglobulin activity. sRBC is a particulate T-cell-dependent natural antigen which activates T-cell to induce activation of enough B-cells in whole splenocyte population and evokes IgM-mediated immune response at higher multitude followed by the complement-mediated lysis of sRBC. IgM binds guinea pig complement more efficiently; thus, the PFC value is influenced by the generation of IgM level. sRBC-mediated antibody response is also routinely used in immunotoxicological studies., In the present study, only CILE and CIRE demonstrated gradual dose-dependent stimulation of the murine humoral immune system as evaluated by PFC and IgM assay. The significant increase (P < 0.001) of the PFC and IgM value of CILE and CIRE at 250 mg/kg dose was higher than that of the control. The PFC value without any antigenic stimulation usually remains at basal level (5–30 PFC/106 cells). HA titer assay is one of the key experiments to establish the immunomodulatory potential of C. infortunatum. Differentiation and proliferation of B-cells into antibody-secreting plasma cells were done by the interaction of naive B-cells with foreign antigens followed by the antibody binding to neutralize the antigen. Thus, a cross-linking latex was formed which was ingested by the phagocytic cells. As the serum of the immunized mice contained antibody against sRBC, agglutination was visible. It was observed that leaf, stem, and root extracts of C. infortunatum exhibited optimum dose for the humoral antibody titer. Counting of peritoneal macrophages is another important parameter that could help in assessing the immunomodulatory activity of C. infortunatum. Macrophages are the important cells that control the cell-mediated and humoral immunity as antigen presenting cells engulf lead to digestion of cellular debris, foreign substances, microbes, and cancer cells in a process called phagocytosis. Activation of macrophages may be responsible for immunostimulation. A significant increase in the number of peritoneal macrophages in case of C. infortunatum- treated mice, therefore, represents its immunomodulatory activity. The increase of PI of yeast cell in a dose-dependent manner in case of all the extracts demonstrated that C. infortunatum consumption had a significant effect on the phagocytic potential of the macrophages which stimulated the innate immunity as well. Our present study showed the adherence property of the murine macrophages increased in a dose-dependent manner and is highest at 250 mg/kg BW in case of leaf extract, and this improvement might be primarily caused due to the increase in the expression of cell adhesion receptors such as integrin and mucin-like molecules. NO is released from macrophage as the primary effector molecule for inflammatory and cytotoxic activity. The release of NO can be used as a marker of macrophage activation. NO reacts with free radical superoxide and forms peroxynitrite which stimulates the production of prostaglandins, a potent mediator of inflammatory conditions. There are various disorders such as multiple sclerosis, arthritis, juvenile diabetes, and ulcerative colitis, which is associated with the release of NO and the NO inhibitory effects of plant materials which directly correlated with their anti-inflammatory potential. Our present study demonstrates that leaf and root extracts of C. infortunatum have a higher potential of NO inhibition than stem extract when macrophages are stimulated by LPS. The inhibition of NO established the anti-inflammatory activity of C. infortunatum. In a certain pathological conditions such as hemoglobinopathies, oxidative stress, and glucose-6-phosphate dehydrogenase deficiency, hemoglobin is destructed and the heme liberates from it. Many components available in the food have the hemolytic activity which makes the erythrocyte lipid bilayer permeable irreversibly, and thus, hemoglobin is released into the medium. Our study revealed that the hemolytic activity of C. infortunatum is very negligible in case of all the extract compared to standard Triton X and therefore may be considered safe from the hemolytic perspective. The present study investigated the in vitro myeloperoxidase and respiratory burst activities of the isolated murine peritoneal macrophage. Recognition and internalization of invading bacteria are the primary functions of the macrophages, and inside the phagosome, activation of NADPH oxidase results in the generation of superoxide anion, which is deprotonated to form O2 and H2O2, from which the highly reactive hypochlorous acid (HOCl) is generated through the myeloperoxidase reaction. Generation of a plethora of oxygenated radical such as superoxide radical, H2O2, hydroxyl radical, singlet oxygen, HOCl, chloramines, NO, snd peroxynitrite, to kill the internalized pathogen, is termed as respiratory burst activity. Total protein, globulin, and albumin level is very important for the immune system. A low protein level can lead to liver and kidney disorders, whereas the insufficient level of albumin and globulin may be the cause of autoimmune disorders. In our study, total protein, albumin, and globulin level was increased significantly by C. infortunatum in a dose-dependent manner, so it can be concluded that C. infortunatum may help in the protection of liver, kidney, and many autoimmune disorders. Functional group identified that using FTIR analysis had serious implications in the anti-inflammatory, antibacterial, and immunomodulatory activity of C. infortunatum. Various ketone analogs were demonstrated anti-inflammatory and immunosuppressive potential through the in vivo model. The hydromethanolic extract of C. infortunatum has C=O, C-H, C=C, and C-O bond-stretching compounds exhibiting the zone of inhibition against the tested organism when compared with control. Hence, our investigation suggests that stem extract of C. infortunatum is a promising development of phytomedicine for antimicrobial properties. There are numerous compounds possessing active nitro groups with diverse medicinal properties, which stimulate the immunomodulatory potential of C. infortunatum. The immunomodulatory activity of C. infortunatum was also supported by chromatographic fingerprinting as the bioactivity of the identified phytochemicals. Azelaic acid present in the leaf of C. infortunatum can be used as an effective treatment for mild-to-moderate acne vulgaris. Squalene present in the leaf, stem, and root of C. infortunatum is a polyunsaturated hydrocarbon and considered as an important substance in practical and clinical uses with a huge potential in nutraceutical and pharmaceutical industries. Squalene possesses anticancer, antioxidant, drug carrier, detoxifier, skin-hydrating, and emollient activities both in animal models and in vitro environments which support the immunomodulatory activity of C. infortunatum. Acetic acid is known to kill a wide spectrum of fungi and bacteria present in C. infortunatum and directly correlated with our antimicrobial study. Stigmasterol present in C. infortunatum shows antioxidant and immunomodulatory activity. Besides, literature review reveals that the phytocompounds present in C. infortunatum is the major cause of the immunomodulatory activity. C. infortunatum displayed potent immunomodulatory activity which may prove beneficial and effective after further exploration. Stimulation of the immune system by herbal medicine is directly correlated to the improvement of depressed the immune system and downregulation of infectious diseases. Our investigations showed that C. infortunatum possess potent immunomodulatory activity by stimulating both innate and humoral arm of the murine immune system. UNICEF. Young Child Survivial and Development: UNICEF Annual Report. UNICEF; 2008. Newman DJ, Cragg GM, Snader KM. The influence of natural products upon drug discovery. Nat Prod Rep 2000;17:215-34. Wiseman N. Traditional Chinese medicine: A brief outline. J Chem Inf Comput Sci 2002;42:445-55. Chan M. Address at the WHO Congress on Traditional Medicine. People's Republic of China. WHO; 2008. Sreevastava N. Clerodendron and healthcare. Med Aromat Plant Sci Biotechnol 2007;1:142-50. Sannigrahi S, Mazumder UK, Pal D, Mishra SL. 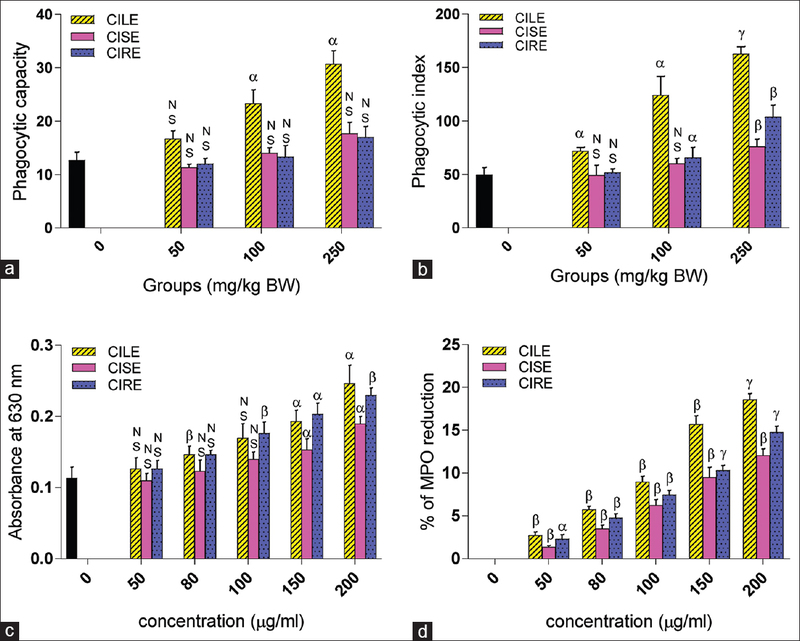 Hepatoprotective potential of methanol extract of Clerodendrum infortunatum Linn. against CCl4 induced hepatotoxicity in rats. Pharmacogn Mag 2009;5:394-9. Pal D, Sannigrahi S, Mazumder UK. Analgesic and anticonvulsant effects of saponin isolated from the leaves of Clerodendrum infortunatum Linn. in mice. Indian J Exp Biol 2009;47:743-7. Kapoor LD. Handbook of Ayurvedic Medicinal Plants. 1st ed. New Delhi: CRC Press; 2001. p. 124-5. Baid SS. Evaluation of antihyperglycemic and hypolipidemic activities of Clerodendrum infortunatum Linn. leaf extracts. Asian J Complement Alternat Med 2013;1:1-8. Barbhuiya AR, Sharma GD, Arunachalam A, Deb S. Diversity and conservation of medicinal plants in Barak Valley, Northeast India. Indian J Tradit Knowl 2009;8:169-75. Chopra RN, Nayer SL, Chopra IC. The Glossary of Indian Medicinal Plants. New Delhi: Publication and Information Directorate, CSIR; 1992. p. 71. Bhattacharjee D, Das A, Das SK, Chakraborthy GS. Clerodendrum infortunatum Linn. : A review. J Adv Pharm Healthcare Res 2011;1:82-5. Kar P, Goyal A, Das A, Sen A. Antioxidant and pharmaceutical potential of Clerodendrum L.: An overview. Int J Green Pharm 2014;8:210-6. Guideline PB. OECD Guidelines for the Testing of Chemicals. Hershberger. 2001;601:858. Harisha S. Biotechnology Procedures and Experiments Hand Book. Hingham: Infinity Science Press; 2007. p. 313-5. Raisuddin S, Zaidi SI, Singh KP, Ray PK. Effect of subchronic aflatoxin exposure on growth and progression of Ehrlich's ascites tumor in mice. Drug Chem Toxicol 1991;14:185-206. Karthikumar S, Jegatheesan K, Thangaraja A, Banupriya K, Dhivya T, Malarvizhi JM. Immunomodulatory activity of Eclipta prostrata in SRBC immunized mice. J Pharmacognosy Phytother 2011;3:52-5. Chakraborty AK, Chakravarty AK. Antibody-mediated immune response in the bat, Pteropus giganteus. Dev Comp Immunol 1984;8:415-23. Lin TH, Rosales C, Mondal K, Bolen JB, Haskill S, Juliano RL, et al. Integrin-mediated tyrosine phosphorylation and cytokine message induction in monocytic cells. A possible signaling role for the Syk tyrosine kinase. J Biol Chem 1995;270:16189-97. Yeap SK, Alitheen NB, Ho WY, Omar AR, Ali AM, Beh BK, et al. Immunomodulatory role of Rhaphidophora korthalsii methanol extract on human peripheral blood mononuclear cell proliferation, cytokine secretion and cytolytic activity. J Med Plants Res 2011;5:958-65. Malagoli D. A full-length protocol to test hemolytic activity of palytoxin on human erythrocytes. Invert Surviv J 2007;4:92-4. Cook MT, Hayball PJ, Hutchinson W, Nowak B, Hayball JD. The efficacy of a commercial beta-glucan preparation, EcoActiva, on stimulating respiratory burst activity of head-kidney macrophages from pink snapper (Pagrus auratus), Sparidae. 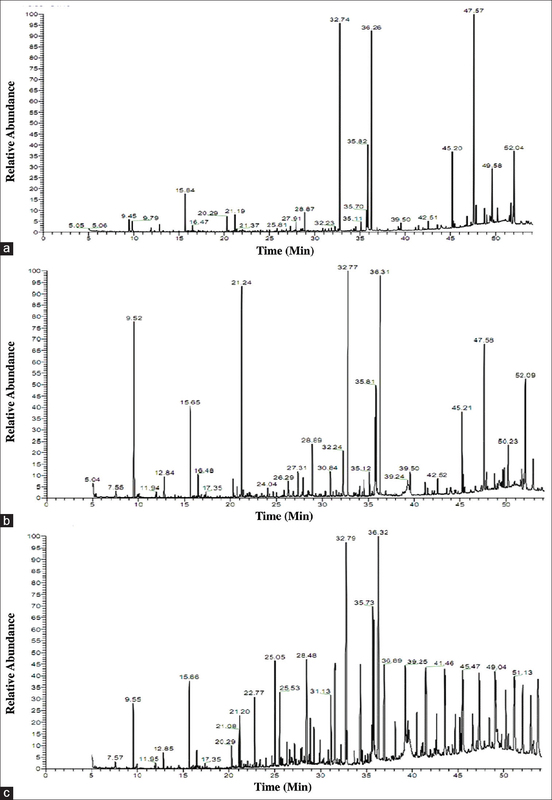 Fish Shellfish Immunol 2001;11:661-72. Sengupta M, Sharma GD, Chakraborty B. Effect of aqueous extract of Tinospora cordifolia on functions of peritoneal macrophages isolated from CCl4 intoxicated male albino mice. BMC Complement Altern Med 2011;11:102. Choi SH, Oh CH. Effects of sodium alginate on the non-specific defense system of the common carp (Cyprinus carpio L.). Korean J Immunol 1999;21:71-6. Silverstein RM, Bassler GC, Morrill TC. Spectrometric Identification of Organic Compounds. 6th ed. New York: Wiley; 2007. Bondada S, Robertson DA. Assays for B lymphocyte function. Current Protocols in Immunology. Unit 3.8. Ch. 3. USA: John Wiley & Sons, Inc.; 2003. Roy S, Tamang S, Dey P, Chaudhuri TK. Assessment of the immunosuppressive and hemolytic activities of an edible fern, Diplazium esculentum. Immunopharmacol Immunotoxicol 2013;35:365-72. Ladics GS. Use of SRBC antibody responses for immunotoxicity testing. Methods 2007;41:9-19. Coligan JE, Vogel SN. Current Protocols in Immunology. Oklahoma City: Wiley; 2005. Cavaillon JM. Cytokines and macrophages. Biomed Pharmacother 1994;48:445-53. MacMicking J, Xie QW, Nathan C. Nitric oxide and macrophage function. Annu Rev Immunol 1997;15:323-50. Landino LM, Crews BC, Timmons MD, Morrow JD, Marnett LJ. Peroxynitrite, the coupling product of nitric oxide and superoxide, activates prostaglandin biosynthesis. Proc Natl Acad Sci U S A 1996;93:15069-74. Dey P, Chaudhuri D, Tamang S, Chaudhuri TK, Mandal N. In vitro antioxidant and free radical scavenging potential of Clerodendrum viscosum. Int J Pharma Biol Sci 2012;3:454-71. Pandey N, Tripathi YB. Antioxidant activity of tuberosin isolated from Pueraria tuberose linn. J Inflamm (Lond) 2010;7:47. Hampton MB, Kettle AJ, Winterbourn CC. Inside the neutrophil phagosome: Oxidants, myeloperoxidase, and bacterial killing. Blood 1998;92:3007-17. Baumann E, Stoya G, Völkner A, Richter W, Lemke C, Linss W, et al. Hemolysis of human erythrocytes with saponin affects the membrane structure. Acta Histochem 2000;102:21-35. Hall IH, Hall JE Jr., Mohseni M, Sajadi Z. Anti-inflammatory activity of diazomethyl ketone and chloromethyl ketone analogs prepared from N-tosyl amino acids. J Pharm Sci 1980;69:1451-2. Chadha R, Venisetty PK, Prasanth S. Medicinal significance of nitroimidazoles-some recent advances. J Sci Ind Res 2003;62:659-65. Iraji F, Sadeghinia A, Shahmoradi Z, Siadat AH, Jooya A. Efficacy of topical azelaic acid gel in the treatment of mild-moderate acne vulgaris. Indian J Dermatol Venereol Leprol 2007;73:94-6. Kim SK, Karadeniz F. Biological importance and applications of squalene and squalane. Adv Food Nutr Res 2012;65:223-33.